Will the real President of Venezuela please stand up? While that’s a question that’s seeming funny on the surface but, for millions of Venezuelans the answer is a matter of political and economic survival. There’s no doubt about the answer, however, in the mind of Juan Guaido. His rise from back-bench obscurity to the US-backed, self-declared interim president of Venezuela in just three weeks has been meteoric — and by his own recognition risky. Few Venezuelans had even heard of the fresh-faced, 35-year-old politician when he was plucked from anonymity and named as president of the opposition-controlled National Assembly in early January. The move set up a high-stakes standoff with President Nicolas Maduro, who is increasingly seen as a dictator both at home and abroad. Instead of backing down, Guaido stunned Venezuelans on January 24 by declaring himself interim president before cheering supporters in Venezuela’s capital Caracas, buoyed by massive antigovernment protests. And support from US President Donald Trump, Canada and numerous Latin American countries, along with the Organisation of American States, immediately rolled in. Moments later, he slipped away to an unknown location amid speculation he would soon be arrested. 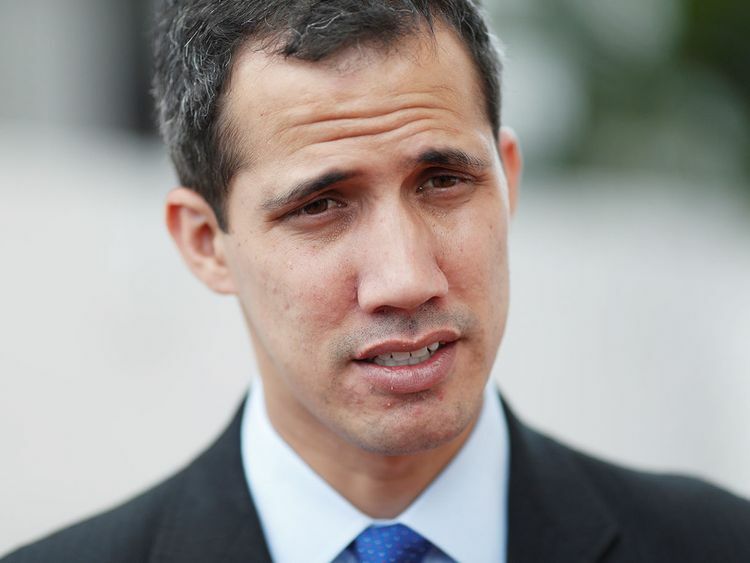 Last week, Venezuela’s feared Sebin intelligence police pulled Guaido from his vehicle as he headed to a town-hall meeting and briefly detained him. And the rival constitutional assembly controlled by Maduro’s allies threatened Guaido and others with an investigation for treason. Key to Guaido’s rise to prominence has been timing — and behind-the-scenes backing. As Venezuela’s economic crisis deepens, with masses fleeing the country to escape runaway inflation on pace to surpass 23 million per cent, many are desperate for a new leader to rescue the once-wealthy oil nation. Into that void stepped Guaido. An industrial engineer who cut his political teeth in a student protest movement a decade ago, he was elected to the National Assembly in 2015, and in its first session this year was named its leader. At the time, Maduro made light of his newcomer status, feigning confusion over whether his name was Guaido or Guaire, a notoriously polluted river that runs through Caracas. But following his presidential self-declaration, and a US-led chorus of Western hemisphere nations backing his challenge, Maduro responded with fury, swiftly cutting off diplomatic relations with the United States and giving American diplomats 72 hours to leave the country. The architect of Guaido’s meteoric rise is Leopoldo Lopez, Venezuela’s most popular opposition leader, who is muzzled under house arrest and considered by government opponents to be a political prisoner. At a time when many had written off the National Assembly, which was stripped of its last bit of power after the government set up the rival constitutional assembly in 2017, Lopez manoeuvred behind the scenes for his Popular Will party to assume the presidency of the gutted legislature. He then tapped Guaido, serving his first full term as a lawmaker, who rose to the helm of their party in Venezuela after eight more senior politicians sitting on Popular Will’s national board were exiled since 2014. Guaido has been a loyal acolyte of Lopez for years, standing beside him at a 2014 news conference when the activist announced a strategy of anti-Maduro unrest. The two talk half a dozen times each day, and not a single speech or move is not coordinated with Lopez first, said one ally. Guaido told the Associated Press in a recent interview he does not fear running into the same fate as his political allies, and he pointed to scars on his neck caused by rubber bullets fired during 2017 street demonstrations against Maduro. “I still have projectiles lodged here,” he said. At the age of 15, shortly after Maduro’s mentor, the late Hugo Chavez, assumed the presidency and ushered in a socialist overhaul, Guaido and his family survived a torrential mudslide that killed thousands and left many more homeless in the port city of La Guaira, a short distance from Caracas and home to the capital’s airport. “We are survivors,” he said. 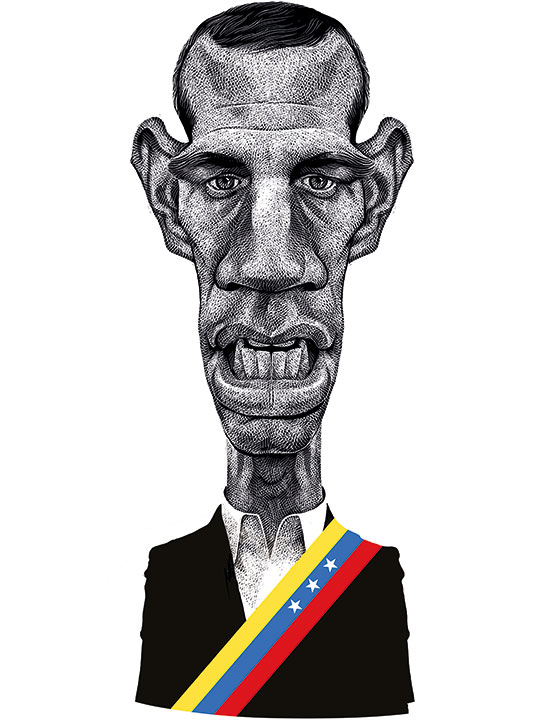 Like Lopez, the wiry Guaido prides himself as an athlete and is a devotee of his hometown’s Sharks — a perennial loser in the Venezuelan baseball league. He and his wife, a fellow activist, have a daughter named after Francisco de Miranda, a precursor to Venezuelan independence hero Simon Bolivar. President Trump promised to use the “full weight” of US economic and diplomatic power to push for the restoration of Venezuela’s democracy. But for the frontal assault on Maduro’s authority to succeed, Venezuelans fearful of taking to the streets again after past uprisings ended in violent crackdowns and bitter divisions must be prepared to risk it all again. Over the past week they responded to Guaido’s call by gathering in the tens of thousands in Caracas waving flags and chanting “Get out Maduro!” in what are the largest demonstrations since a wave of unrest that left more than 120 dead in 2017. While the protests were mostly peaceful, there were no signs that security forces heeded Guaido’s call to join the anti-Maduro movement and go light on demonstrators. His supporters say the constitution gives him the authority to declare himself interim president as head of the National Assembly. “The constitution gives me the legitimacy to carry out the charge of the presidency over the country to call elections,” Guaido said last week. For now, the military are standing by Maduro, and unless they change sides, the unrest will continue, with the risk of violence of other interventions not abating anytime soon. Do you see the poison on your plate?